Adapt the decoration on your cookies, or the color of the frosting, for any holiday. This creamy frosting is a fun, easy way to decorate cookies. It’s not as fancy or sophisticated as icing, which is smooth and glossier, but it’s simple and yummy, and decorations like sprinkles stick to it easily. It’s especially perfect for spreading on sugar cookies. I got this recipe years ago from a Williams-Sonoma booklet on making Christmas cookies. I keep that booklet in the front pocket of my dessert recipe binder and refer to it often when making any kind of cookie that needs decorating. This makes about 3/4 cup, or enough to frost 2 dozen regular cookies (about 2 1/2 inches in diameter). With the brown vanilla extract, the frosting comes out an off-white color. Try a clear extract if you want it pure white, maybe playing around with some flavors of extract to see how it turns out. This can also easily be tinted with food coloring. Sift the confectioner’s sugar into a large bowl about 1/2 cup at a time. Add the melted butter, vanilla, and cream. Using an electric hand mixer, beat on medium speed until creamy and spreadable. I made this cake for our son’s birthday as part of a Sesame Street-themed party. It was actually his “smush cake” — his own cake for grabbing and devouring and making a mess. The blue frosting got all over his hands and mouth and cheeks, which we all found fun and messy! For the cake, I used this white cake in a 6-inch round pan. I also used one batch of buttercream frosting, tinted with numerous drops of blue food coloring (I lost count of how many drops I used, but it was around 20). 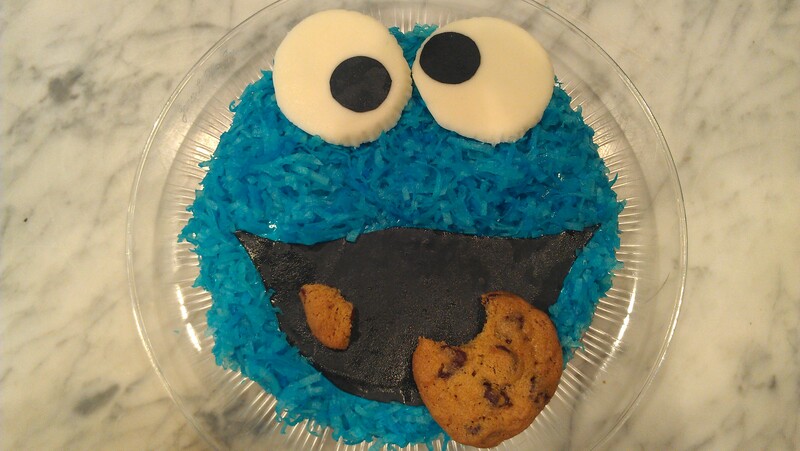 What I did first was make Cookie Monster’s eyes. I used a Wilton Sugar Sheet in black. It’s edible decorating paper and comes in all sorts of colors. You can punch out designs or make your own, then simply peel them off and stick it onto frosting. (I found it at Michael’s craft store, but you can also order them online). I punched out two large dots of the sugar sheet using the wide circular end of a decorating tip for a frosting bag. I placed each dot on the bottom of a paper baking cup, peeled side up, right at the edge. Then I poured melted white chocolate on top, just enough to reach the edges of the cup, and let it cool. I used about 2 oz. of the chocolate, melted in the microwave for 30 seconds and then stirred by hand until it was fully melted. I then covered the cake in blue-tinted coconut flakes, sprinkling them over and lightly pressing them into the frosting. I left clear some space at the top for the eyes, so they could adhere to the frosting. I attached the now-hardened white chocolate eyes at the top edge, leaving part of them sticking out over the edge of the cake. I turned the black parts of the eyes in different directions to achieve Cookie Monster’s googly-eyed look. Lastly, I put a “bitten” chocolate chip cookie on top of the black mouth. I used a knife to cut out a “bite” from the cookie, then laid the bitten cookie at the edge of the mouth and the bite of cookie inside the black to look like Cookie Monster was in the process of eating it. I had baked the cookies with Toll House pre-made cookie dough to save time. Whatever cookie you use, make sure the diameter of the cookie roughly matches the diameter of the eyes, or is even a tiny bit bigger, for the best dimensions. To make the colored coconut flakes, put 1/2 cup of flakes in a zippered plastic bag. Dissolve a couple of drops of food coloring in 1/2 tsp. water, then add that to the bag, seal, and mash it around with your fingers until the coconut is evenly colored. This fluffy frosting is great for decorating cakes and cupcakes. Easily add color with food coloring. It comes from the Hummingbird Bakery in London, where tray after tray of colorful cupcakes begin tempting you as soon as you walk through the door. It’s a wonderful but dangerous place for any sweet tooth. Beat the sugar and butter together in a freestanding electric mixer with a paddle attachment (or use a handheld electric whisk) on medium-slow speed until the mixture comes together and is well mixed. Turn the mixer to slow speed. Combine the milk and vanilla extract in a separate bowl, then add to the butter mixture a couple of tablespoons at a time. Once all the milk has been incorporated, turn the mixer up to high speed. Continue beating until the frosting is light and fluffy, at least 5 minutes. The longer the frosting is beaten, the fluffier and lighter it becomes. If adding food coloring, add just a couple of drops at a time and mix well until you achieve the desired color.